In a dimly-lit room in Van Leer, a small crowd gathers around a large tabletop structure and waits for something to happen. In an instant, the white surface of the tabletop lights up with an image of a warehouse floor plan, projected from above. Seven small robots leave their stations all at once and begin weaving around the model warehouse, simulating forklifts moving packages. Each package is represented by an illuminated marker on the robot. Once the simulation is complete, each robot finds its way back to its charging station, where it awaits the next task. This is the Robotarium, a remote-access robotics lab located in Van Leer that opened in 2017. The lab was funded by the National Science Foundation and by the Office of Naval Research with the goal of making swarm robotics research free and accessible to anyone with an algorithm idea. Sean Wilson, Ph.D., is a research engineer who runs the lab. He demonstrated the warehouse simulation at a public open house held on Jan. 18, 2019. This particular warehouse simulation was paid for by a company and will continue to run for several months, but the Robotarium runs many different simulations throughout the year for free. For example, a team of Tech students tested a Capture the Flag simulation through the lab for a final class project on network theory. The game simulation consists of two teams, and each team’s algorithm was written by a different student. While the simulation runs, an image of a field with boundaries and two flags on either side is projected onto the tabletop. Those who want to use the Robotarium for research or even for recreational purposes need only create a Robotarium account online. Uploading and submitting code is completely free and the Robotarium does not ask users to explain the goals of their research. Anyone can download the Robotarium’s simulator in Matlab or Python. Users will only be denied if they are from a company or if they are trying to make a profit. The robots in the demonstration were constructed in-house by Wilson. The main processors on the robots are a Raspberry Pi Zero W and a Teensy 3.2. Wilson is still building robots and will make 50 in total. The lab serves an important role by establishing a standard through which different algorithms may be compared. It can be hard to discern which of two algorithms works better when they are tested in different environments with different robotics equipment, so the Robotarium can act as a control. The employees in the lab do not check the code or look at the data resulting from simulations, but Wilson guarantees that submitted code will not break the robots. The Robotarium utilizes code based on the concept of barrier certificates in order to protect the equipment. Ph.D. students who work in the lab “do a lot of the coding heavy lifting” that makes this system possible, according to Wilson. 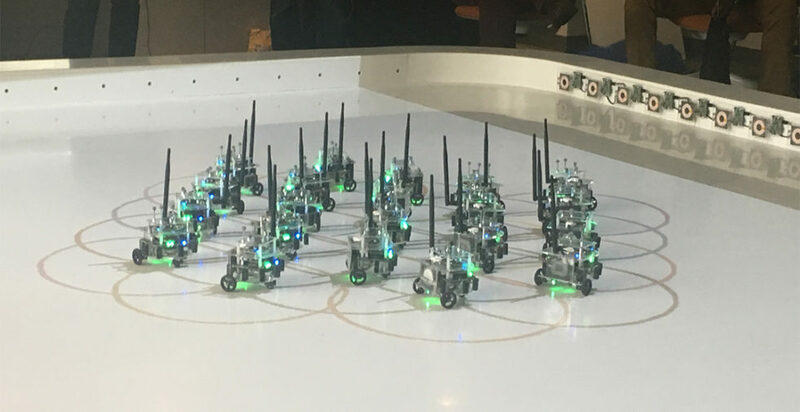 The positions of the robots are monitored by eight motion-capture cameras above the arena and by asymmetric markers on the robots that communicate their orientations. “They have little hats or markers that reflect infrared light. Like a satellite, it lets you know where they are in space,” Wilson said. Large windows in the lab allow interested passerby to watch the simulations on their way to class. However, since the simulations are run on a first-come-first-serve basis, users often do not see their simulation run in person. Instead, the Robotarium provides users with a video recording of the outcome. Users can also have an image of a specific environment projected on the arena to provide more context for real-world applications in the video. The amount of code that gets sent in to the Robotarium varies depending on the time of year. The lab sees increases in submissions when a robotics competition or conference comes to Atlanta. Wilson expects the popularity of the Robotarium as a robotics resource to continue rising. “This is the only one in the world — it’s unique to Tech and to the world,” said Wilson. “The most important aspect is democratizing robotics access.” Currently, the Robotarium has been used from every continent except Antarctica. Researchers from other universities have also taken advantage of the Robotarium’s resources. For example, a biologist from Arizona State University who was studying how ants in a colony select their queens submitted a queen-selection algorithm to the lab. The Robotarium is also currently working with Ford Motor Company to research how to best enable autonomous vehicles to interface with humans. “How do you deal with people in the road, or shopping carts [in the road]?” Wilson said regarding the goals of the research with Ford. The next challenge the Robotarium faces is making flying robots, or quadcopters, more accessible. This is difficult because the flying robots are lightweight and difficult to land, and they only maintain battery charge for a few minutes. For this reason, experiments run with quadcopters must be short, otherwise the equipment can be damaged by falling to the ground. Ultimately, the Robotarium plans to have “swimming, walking and flying robots,” Wilson said. But for now, students can learn more about running their code through the Robotarium by visiting robotarium.gatech.edu.